Stable, predictable, and adequate transportation revenues are needed if California is to plan and deliver an excellent transportation system. 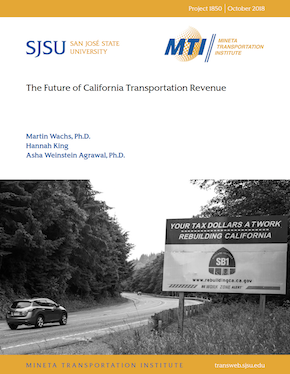 This report provides a brief history of transportation revenue policies and potential futures in California. It then presents projections of transportation revenue under the recently enacted Senate Bill 1, the Road Repair and Accountability Act of 2017. Those revenue projections are compared with projections of revenue should SB 1 be repealed by voters in the November 2018 election. State-generated transportation revenues will be higher under SB1 than if the act is repealed. For 2020, the mean projection is that the state will collect $10.4 billion with SB1 in place and $6.6 billion without it, a difference of $3.8 billion. Over time, changes in fuel economy and other factors will change annual revenue By 2040, the mean projection is that the state will collect $8.6 billion with SB1 and $3.4 billion without it, a $5.2 billion difference. The total of all state transportation revenue collected between 2018 and 2040, assuming no other revisions to transportation revenue programs during these years, will be about $100 billion less if SB 1 is repealed than if the law is retained. The final section of the report addresses public attitudes toward transportation tax and fee policies, since future any policy changes must be informed by public willingness to consider revenue increases and opinions about which taxes or fees would be most appropriate. Dr. Wachs is Distinguished Professor Emeritus of Civil & Environmental Engineering and of City and Regional Planning at the University of California, Berkeley, where he directed the Institute of Transportation Studies. He earlier spent 25 years at UCLA, where he was Chairman of the Department of Urban Planning for eleven years. After retiring from the University, he became the Director of the Transportation, Space, and Technology Program at the RAND Corporation in Santa Monica. Wachs is semi-retired, teaching courses and conducting research at UCLA in transportation policy and working on transportation policy projects at RAND. Wachs currently serves as a member of both the California High Speed Rail Peer Review Group and the Technical Advisory Committee for the California Road Charge Pilot Program. Ms. King is currently a PhD student in transportation planning and policy at UCLA. Prior to UCLA, she earned a Master’s in Urban and Regional Planning and a Master’s in Geographic Information Systems from Florida State University. King was previously employed at the Florida Department of Economic Opportunity, where she worked to produce guidance for local communities planning for the impacts of sea-level rise. Dr. Agrawal is the Director of the MTI National Transportation Finance Center and also Professor of Urban and Regional Planning at San José State University. Her research and teaching interests in transportation policy and planning include transportation finance, bicycle and pedestrian planning, and travel survey methods. Agrawal also works in the area of transportation history. She has a B.A. from Harvard University in Folklore and Mythology, an M.Sc. from the London School of Economics and Political Science in Urban and Regional Planning, and a Ph.D. from the University of California, Berkeley, in City and Regional Planning.